hd00:10Cleaning colorful plastic cutting board from remnants of food. Application of disinfectant solution. Washing of premises and equipment in food industry, supermarkets, warehouses and similar places. hd00:19CALIFORNIA USA 1940s – Baby chicks in a cardboard box. Workers harvesting tomatoes and lettuce. 4k00:14Shop owner cutting Fresh fish portions with a large knife. 4k00:05Hydrophobic effect. Water is flowing out of car surface. 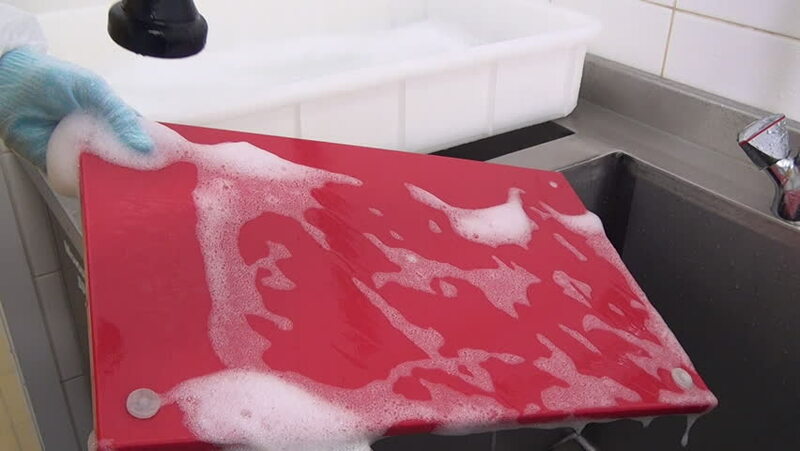 4k00:17Woman washes a metal sink with sponge in the kitchen in red gloves. Hands close-up.